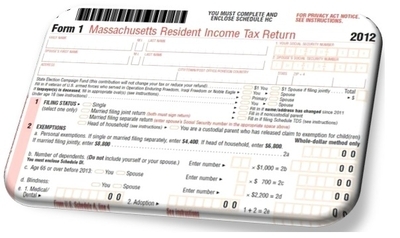 FIVE TIMES — in 1962, 1968, 1972, 1976, and 1994 —Massachusetts voters have been asked to jettison their state's flat-rate income tax and replace it with a system of graduated tax brackets. Each time they have unequivocally refused to do so. After that many rejections, even the most importunate suitor usually gets the message. But for some liberal true believers, all can never be right with the world as long as Article 44 of the Massachusetts Constitution commands that taxes "shall be levied at a uniform rate throughout the commonwealth upon incomes derived from the same class of property." So here we go again. Raise Up Massachusetts, a coalition of left-wing activists, labor unions, and "social-justice" advocacy groups, is gearing up to put yet another graduated income-tax amendment on the ballot. As always, they will preach the virtue of picking other people's pockets, promising lots and lots of expensive goodies at no cost to anyone but millionaires. More than a century ago, the Legislature recognized the fundamental inequity of imposing higher marginal tax rates on higher incomes, a perpetual invitation to class warfare. Lawmakers refused to allow the practice in Massachusetts, even as most other jurisdictions embraced it, and they went so far as to write that prohibition into the state constitution. Plainly it is a stance that has stood the test of time, having been reconfirmed at the polls on five separate occasions. Still, liberal Democrats like state Senator Jamie Eldridge, who has filed a constitutional amendment to overturn Article 44 and mandate graduated income tax rates, hope the sixth time will be the charm. Like every grad-tax advocate, his pitch is one part soak-the-rich envy, one part government-spending wish list, and one part feel-their-pain con job. Some concoctions improve with age. This isn't one of them. "Few people would consider a tax system to be fair if the poorer you are, the more of your income you pay in taxes – and yet that's exactly what the Massachusetts tax system currently does," argues Eldridge. Switching to progressive tax brackets, he says, could "potentially" mean "lower taxes for the majority of Massachusetts residents." And all it requires is "asking a small percentage of residents with very high income to pay their fair share." Notwithstanding their rhetoric about "fairness" and the disproportionate share of income paid by the poor to the tax man, the activists evade the simple fact that of all the taxes levied in Massachusetts — on income, sales, meals, gasoline, tobacco, liquor, and property — the income tax is already the most progressive. Massachusetts has a flat tax on income — but when deductions, credits, and exemptions are taken into account, the state's income tax system is in fact quite progressive. According to Department of Revenue data, all the other state taxes take a much larger bite out of lower- and middle-income residents' earnings than out of those in the highest income bracket. For example, taxpayers in the bottom income quintile lose 7.5 percent of their income to sales taxes; for taxpayers in the top quintile, the comparable figure is 0.8 percent. The state income tax is different. Though there is a single flat rate for regular income (currently 5.15 percent), there are also exemptions, credits, and deductions skewed to ease the tax burden on low-income earners, as well as a much higher tax rate on capital gains (12 percent), which overwhelmingly affects high-income earners. 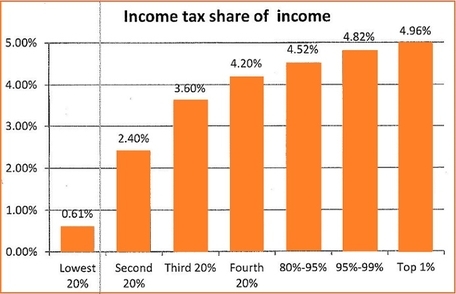 As a result, the effective income tax rate for taxpayers in the bottom fifth is only 0.6 percent. For those in the middle fifth, it's 3.6 percent. For the top fifth, 4.75 percent. Progressivity defined. What's more, taxpayers making $100,000 and up contribute a whopping 70 percent of the state's income tax revenues. Those making $50,000 or less? Only 11 percent. Massachusetts voters have always seen through the grad-tax hustle. Five times they've said no. If that wasn't clear enough, we can always make it six.